November 22, 1963 dawns with excitement in Fort Worth, Texas – President Kennedy is in town. The author leaves his childhood family home for his west-side elementary school. His brother is already downtown with his choir mates, preparing to perform for the First Couple, a host of dignitaries including Vice President Johnson and Texas Governor Connally, and a large breakfast crowd. Later, a morning drizzle clears to bright sunshine before Air Force One departs over the author’s school, carrying the presidential party to Fort Worth’s sister city for their next stop. But when shots ring out in Dallas within the hour, the world changes. The lives of many are altered, some more than others. Among those are the Livingstons of Fort Worth. 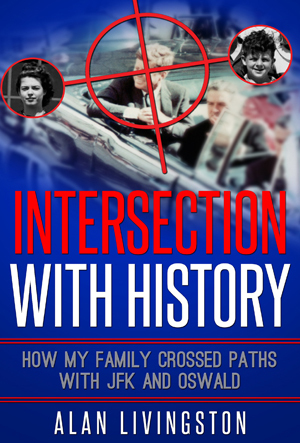 “Intersection with History” is the story of how that day steered a mother and former teacher to appearances ranging from television and Life Magazine to testifying for the Warren Commission, and how her oldest son’s life was changed forever by a hand shake. “Intersection With History” contains bonus material: The opening chapters of “Gabriel’s Creek”, the author’s novel of a man’s inspirational round of golf on a magical course with an unusual dog.